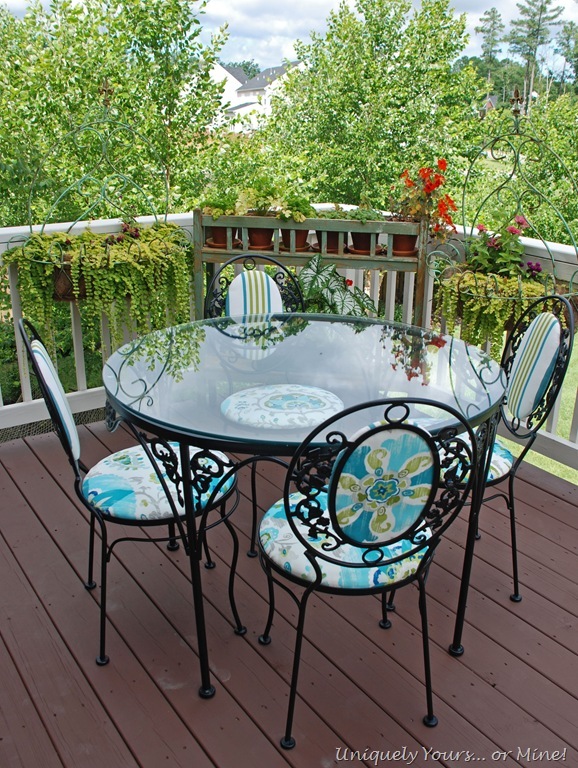 The Second Time Around Patio Set – Uniquely Yours… or Mine! So I almost didn’t share this makeover with you… I’m a little embarrassed and you will see why! 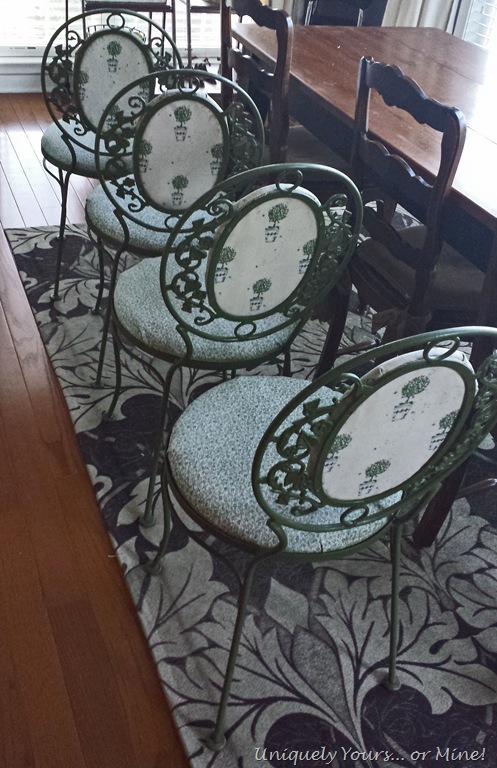 I bought this vintage patio set about 12 years ago, it had no bottoms or back but I just loved it! 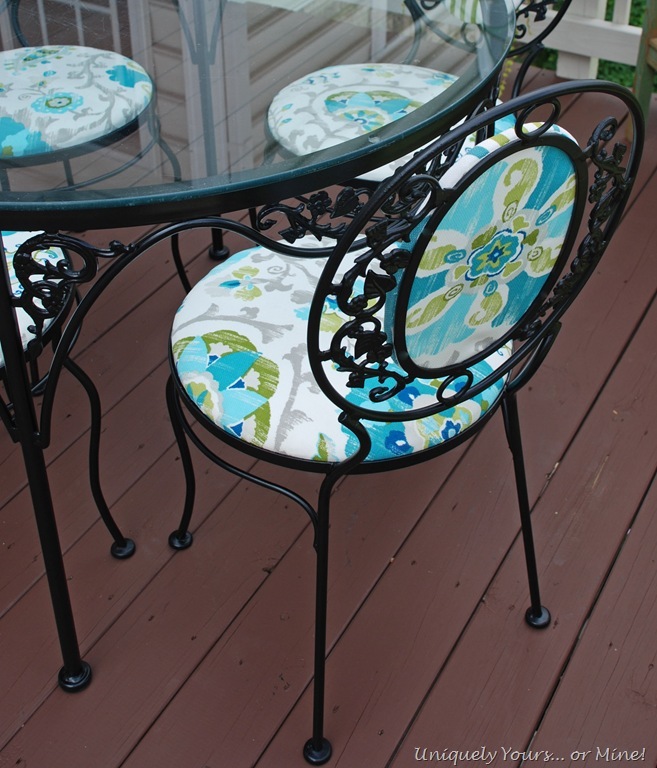 Back then I painted the metal and I covered the seats in good quality outdoor fabric, but now they are way past needing an update… and yes, these yucky things have been sitting on my deck… so GROSS! I think the nastiness on the back is a mixture of algae, mildew and bird crap! But other than that isn’t it a pretty set? 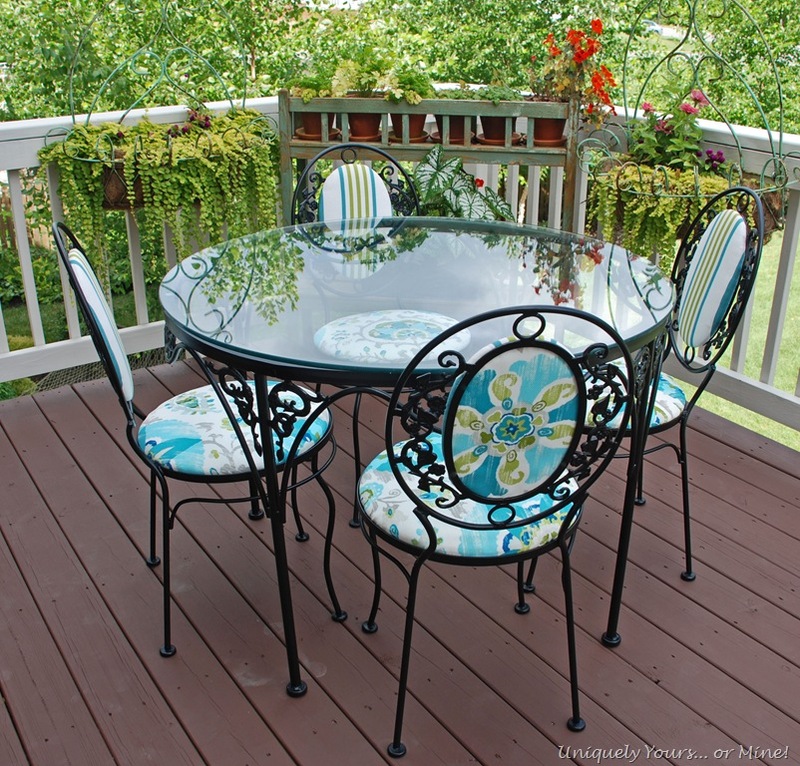 Here is the table, I just adore the leaf patterns in the iron work. So here is the much improved AFTER! 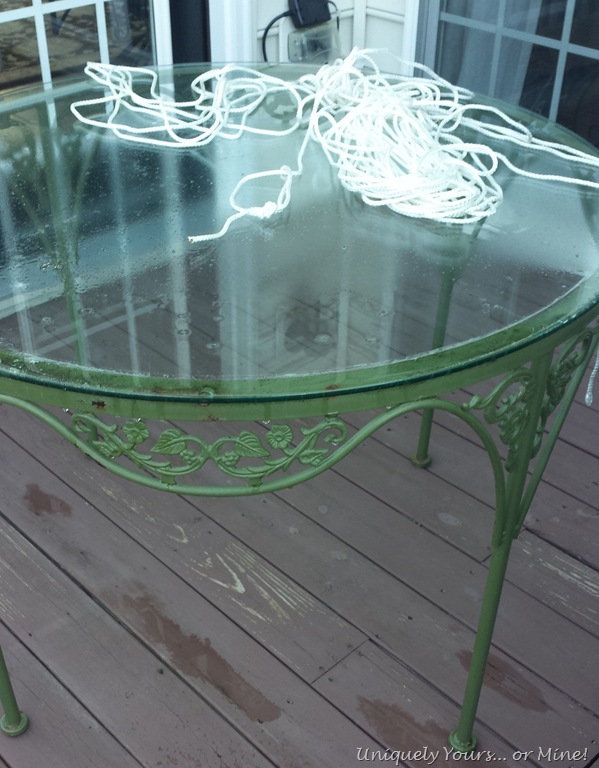 I sanded away any rust spots and sprayed the spots with a clean metal primer by Rustoleum. I then spray painted the whole set a satin black, it took about 4 cans but I got it done! I LOVE this fabric I bought from Ufab, here in Richmond, it’s outdoor fabric and at about $25 a yard it better hold up for another 12 years! The colors work great for us as we have both blue and green in some of our other pieces. 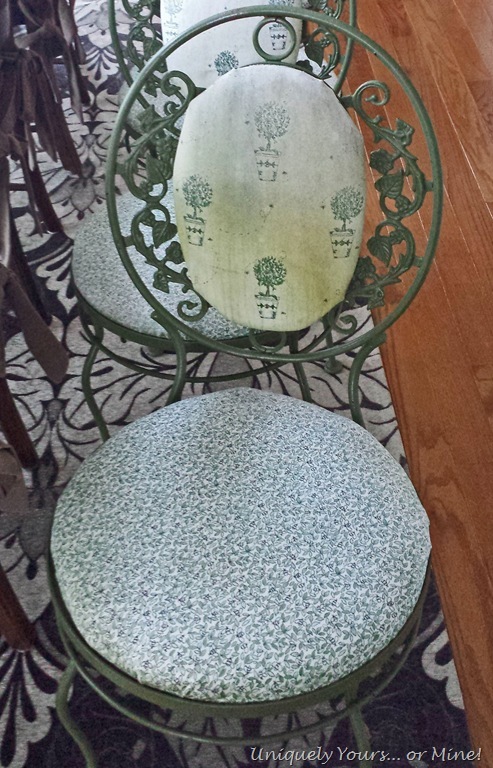 I used the same fabric for the back of the seat cushions, I just found the flowers in the pattern and cut them out. Doesn’t the set look much more inviting? Changing out the fabric on this set was pretty easy, I just had to remove a BUNCH of staples and I used the old fabric as a template for the new fabric. It took a while to sand and spray the set, but once I was done I was thrilled with the results. It’s like I have a whole new set for a fraction of the price. There is nothing like a move to get you motivated to finish the long put off projects right? Thanks Suzan, I do like looking at it! Beautiful. So fresh and bright. Looks brand new. Thanks for sharing. Thanks Ellen, I’m glad you liked it! 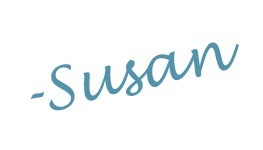 Very, very nice, Susan!! Thanks for the fabric store, too … I see a visit to Ufab in my near future. Thanks Connie, you’ll love Ufab, lots of great remnants too.. Thanks Sharon, you’re always so sweet and supportive! It looks great! I love the black with the new fabric. Susan, this is so gorgeous!! I love the fabrics and the color black is perfect! Sorry I haven’t been around for a bit. Thanks Cynthia! It’s ok, we all get busy! We sold our home and we have been under a lot of stress, via blog. WOW! I’m in love! You did a fantastic job….kudos!! You have such good taste! I have an old grey set from Sears that is so dull now. You gave me some good ideas. Thanks Rosemary, I hope your set turns out awesome! Susan: Do you have an unfinished sideboard that you are willing to sell? Now that you are moving and getting rid of things. I live just south of Charlottesville and can pick one up from you? Susan, what a fab transformation, so fresh, what a great job. It’s a beautiful set, they last forever. I love it! 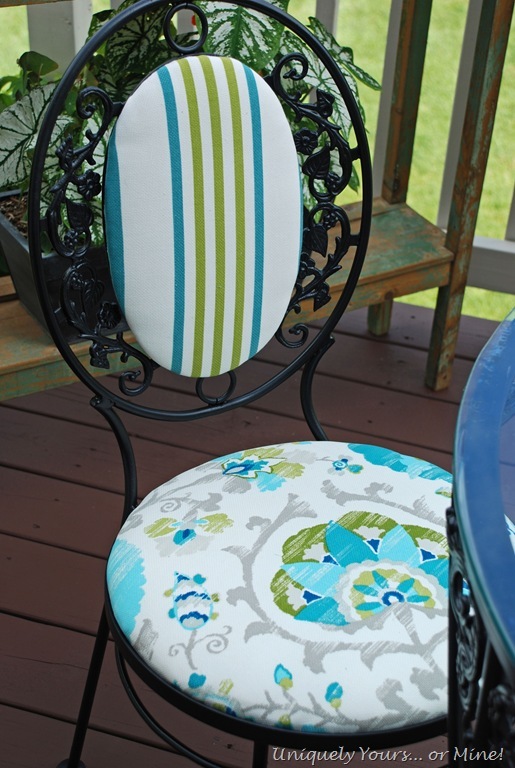 Especially using the complimentary stripes & floral pattern. You will get years of use from this set.